Lee Bennett works for Bolton Wanderers FC. 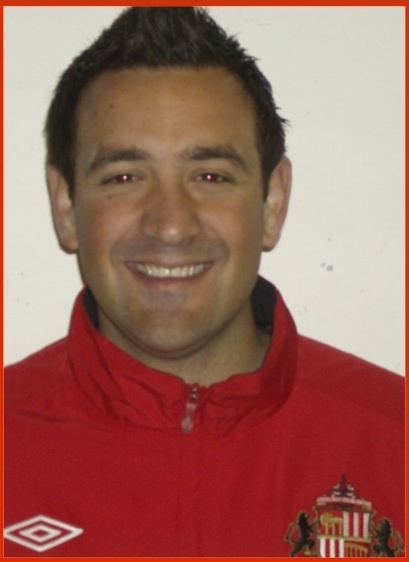 He works for Botlons Wanderers FC Academy and for the International Soccer Schools program. 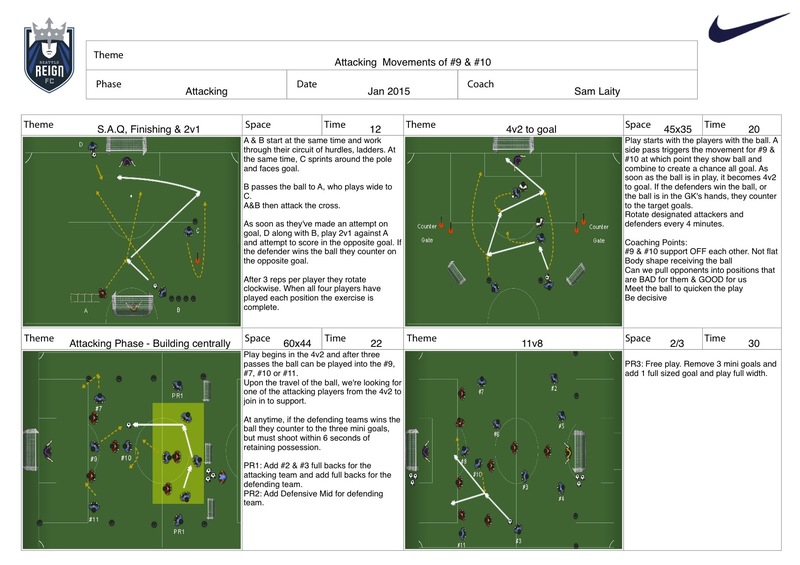 He holds a UEFA B License and FA Youth Module 2. Justin Neese is the Assistant Manager, Soccer Programs at the Houston Dynamo. He holds the USSF ‘A’ License. Jamie Wright is 29 and os a UEFA B Coach. His job role is Head of Football Development (SAFC Foundation of Light) & Assistant head of Foundation Stage (SAFC Academy). Jamie is now Head of the Football Development department at SAFC Foundation of Light where he writes new coaching delivery programmes as well as developing and writing a coach education programme. He is also responsible for quality managing all SAFC Foundation coaching delivery as well as ensuring coaches adhere to the SAFC Player Pathway. The Academy role see’s Jamie take responsibility for the 5 to 8 year old age group as part of SAFC’S category 1 Academy. Jamie also assists the head of phase working with the 9 to 11year old players. 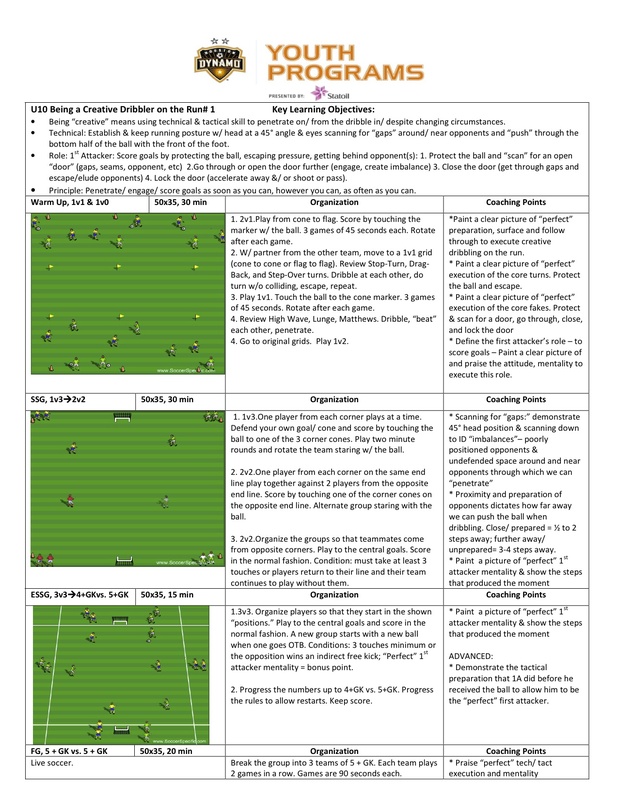 This basic passing session allows player to focus on a particular technique (passing and receiving the ball). Aim is to follow the sequence above whilst hopefully instilling good habits i.e. 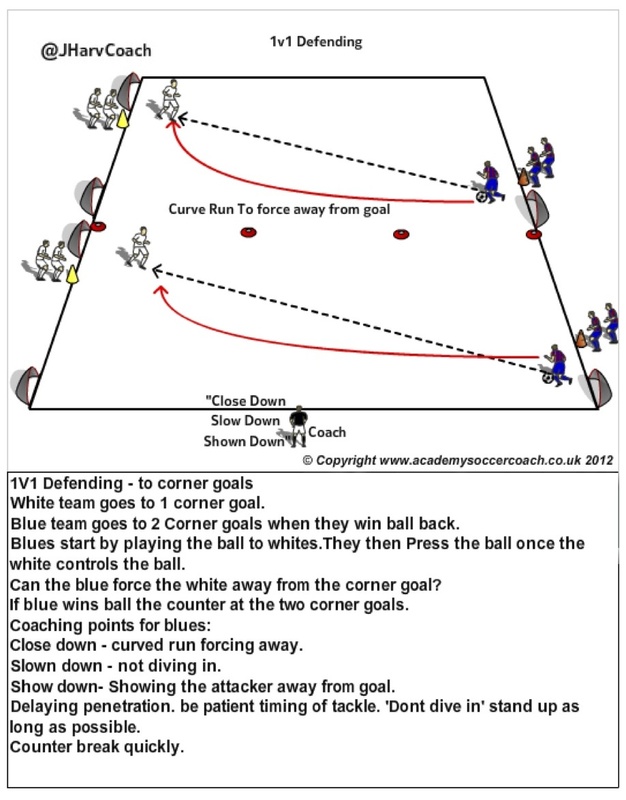 getting side on to receive ball, checking shoulder etc… Once the group have had a go at right foot, switch sides to left foot. 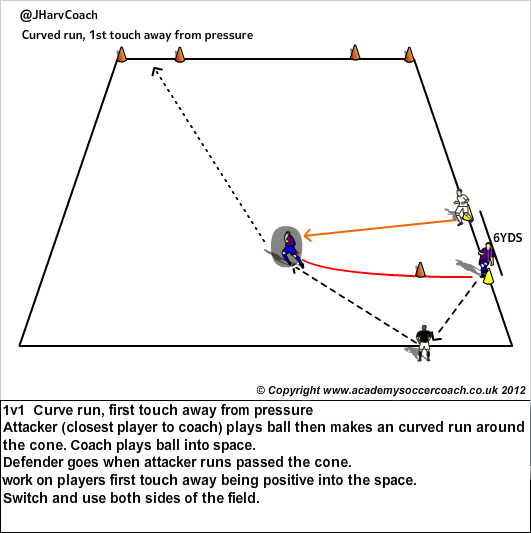 Session can finish with a competition to see who can ‘score’ the most passes into the smaller goals. 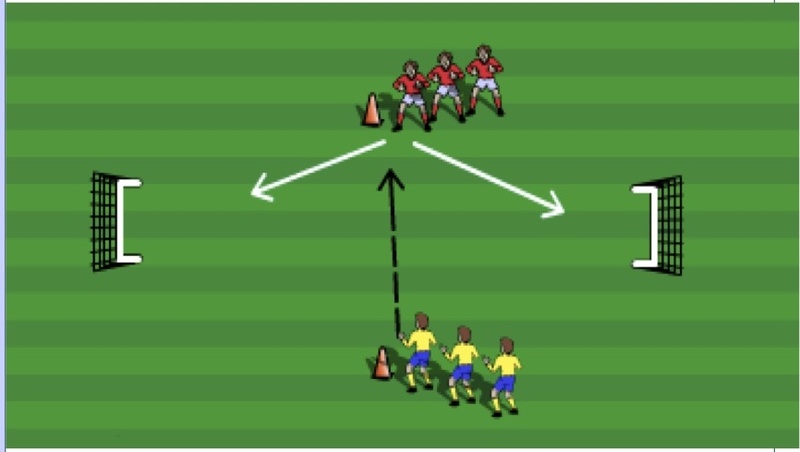 Yellow player plays the pass into the red player who upon receiving the ball can score in either goal. 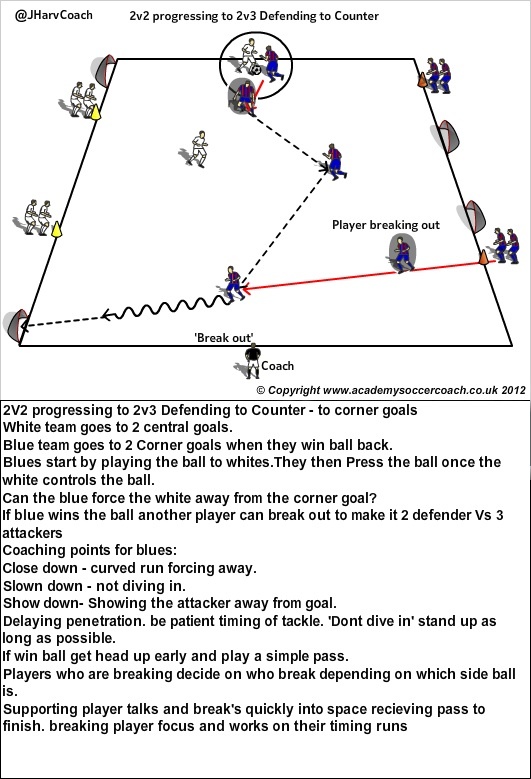 The yellow player becomes the defender, coach can incentivise the defender by giving him 2 points if they retrieve the ball and score themselves. Lee has been working for Chelsea FC coaching within their youth academy since 2006. He previously worked for Crystal Palace FC Academy working closely to develop the clubs youth development program. He holds a UEFA B Coaching Licence, FA Youth Modules 1,2,3 and is a registered Learning Tutor for the English Football Association. His philosophy is to create a learning environment that allows young players to play with creativity and imagination developing self-confidence and belief that they can achieve personal success. Recently Lee has been coaching for insidesoccer. 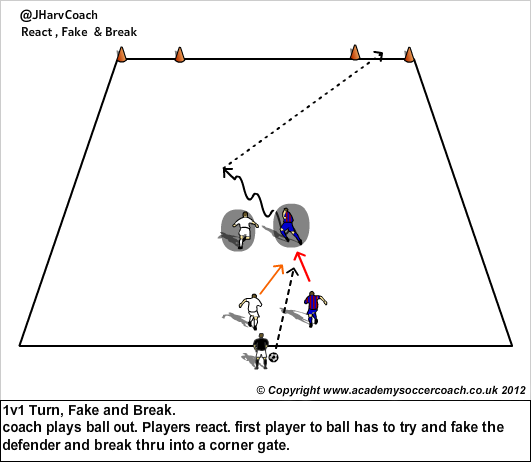 Here are a number of 1v1 Exercises that encourage reaction, speed of play, turns, fakes, breaking into space (acceleration). 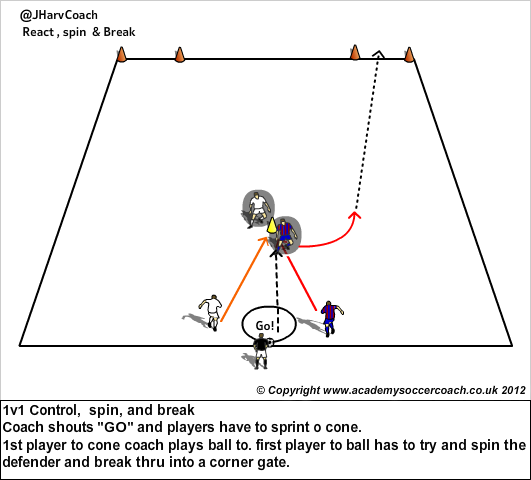 All exercises can be used for all ages. It is important to make all games competitive. 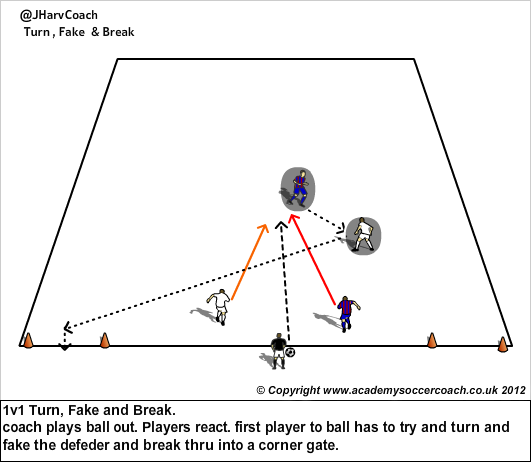 With all exercises encourage players to do fakes to create space. Fakes – examples: Scissors, Step Over, Double Scissors, Snake, Ronaldhino etc. 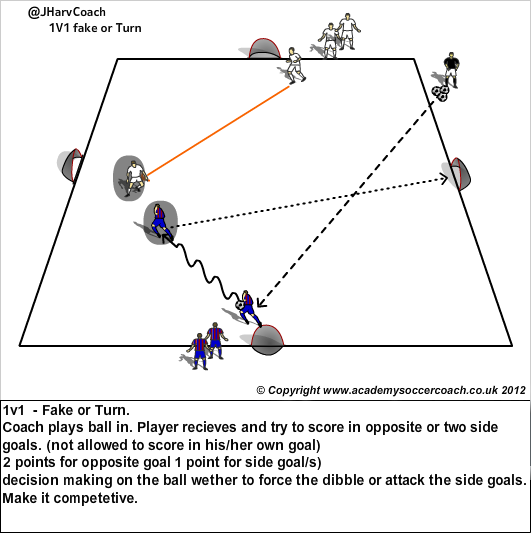 Coaches can give players points for scoring goals and for using fakes to score, Encourage creativity.